Motorola plans to release a follow-up to its Xoom Android tablet in November, but only in the United Kingdom and Ireland for now. The Xoom 2 is the same basic size as the original, with a 10.1-inch widescreen display, and follows a familiar tablet formula of thinner, lighter and faster. It packs a dual-core 1.2 GHz processor compared with 1 GHz in the original Xoom, and it's 10 percent lighter and 33 percent thinner. Other specs include more than 10 hours of battery life, a 5-megapixel camera in the back, a 1.3-megapixel camera in the front, 1 GB of RAM and 16 GB of storage. 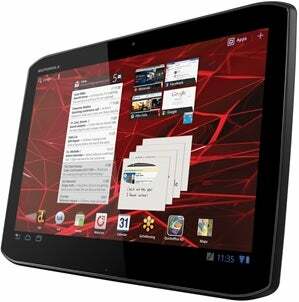 Motorola is also launching the Xoom 2 Media Edition, which has an 8.2-inch display. Its other specs are identical to the Xoom 2, except for battery life, which clocks in at more than six hours. The tablets feature Android 3.2, a Honeycomb variant. The Xoom 2 Media Edition. Both tablets have a new design that Motorola claims is easier to hold. The design looks a bit like the Droid RAZR smartphone, with rounded sides that ease into sharper corners, making me wonder whether Motorola is trying to come up with some distinct aesthetic to set its products apart. The Xoom 2 and Xoom 2 Media Edition also include a splash guard and Corning Gorilla Glass, and they're both Wi-Fi only. Motorola says it has no plans to launch the Xoom 2 in the United States, as the company focuses on its Droid RAZR launch, Business Insider reports. I'm guessing the Xoom 2 could show up stateside eventually, but don't count on it for this holiday season.